I feel a little uninsprired today. We had a great weekend, but life here in Zeeland is returning to "normal", meaning our trans-continent and trans-atlantic journeys are giving way to local, every-day adventures. To celebrate Lukas' Birthday, family came up from Germany to visit, and, to our surprise, the sun made an appearance during their stay. 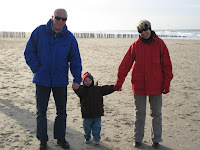 We took them to Domburg, which was also a first for us -- a beautiful little resort town with pretty, dog (and horse) friendly beaches, bordered by miles and miles of dunes. Yesterday, we spent some time in Goes, realizing (for the umteenth time) that many shops are closed on Mondays, and of those that are open, some wait until the seemingly random time of 1 PM to open their doors (can anyone tell me why?). Biding time, we had lunch at one of the few restaurants open in the city on Monday, The Jersey, on the city's Grote Markt, or main square. Then we visited a (quintessentially Dutch) cheese shop before heading back to Oudelande. How else have I filled my time lately? Well, I've gotten very much into my Best American Travel Writing (2006) book, despite several rather dismal entries. Among the stories that bored me were "Where They Love Americans . . . for a Living" a piece about scumbags that travel abroad to fuel overseas prostitution, complete with some very crude language; and "The Price of Paradise", a less than inspiring article focusing on Hawaii's lost charm. I'm now on "The Parachute Artist" though, and, to my relief, I can already sense that it's written by a travel writer worthy of the title. Another overcast day, my goals for today are modest. Take the dog on a walk at some point before sunset, try to keep myself and Lukas busy enough to forget that our company left this morning, and make a plan for the next few weeks (and months)... focusing on what we want, and what type of routine we'll need to accomplish those goals. It's not easy to feel "at home" here after being "home". I miss my Mom, my sisters, my Aunts, my Uncles, my cousins, and my Grandparents. I miss sunshine, warmth, Park Avenue, Starbucks, Publix, Target, shopping malls and (shame on me) SUVs. I miss Lukas' friends for him, already spread across the U.S., Germany, and South Africa. And although it's high time for us to finish setting up camp here in The Netherlands... I'm reminded that there's so much more to "home" than the structure itself, and the material things inside of it. Home is what we make of it. We miss you so much! 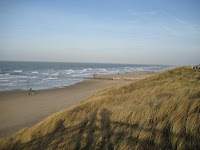 It's great to hear that you're settling into your home life in the Netherlands.